The Lomo Smena 8M is a Soviet entry-level compact camera. That tells a lot. In the early 70's, at a time when Western countries filled their cameras with decadent electronic gizmos, the glorious Soviet Union decided to offer its heroic workers a tool to put their natural creativity at the service of the Party and to take pictures of their holidays at Novosibirsk. The Lomo Smena 8M was born. Made of plastic except for the aluminum lens and shutter assembly, the Smena 8M is very light. The lens is a coated 40 mm f/4 T-43 triplet. The shutter gives speeds from 1/15 s to 1/250 s with flash sync at all speeds, possibly the only remarkable feature of this camera. The very unaccurate viewfinder is a clear frame without lens. Focusing is unaided. 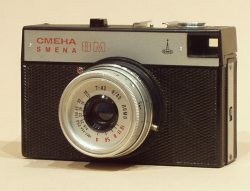 The Smena 8M was made from 1970 to 1993 and was folowed by the Smena Symbol. The Smena 8M was scientifically engineerd to waste as much shots as possible. Shutter cocking and film advance are separated, allowing to superpose pictures, or half-pictures if the film partially advanced all by itself. One then usually forgets to focus as the viewfinder gives no focusing indication of any kind. When shooting, the cocking lever returns to its initial position. Its trajectory naturally meets the fingers of the photographer, stopping the shutter release. Surviving pictures will finally benefit from light leaks, the body being horribly adjusted. Film is rewound by a little knob. Along with standard indications, the Smena settings can be adjusted with clever symbols. Once the film sensitivity is set with the aperture ring, speed is set on the approptiate symbol : sunny, overcast, cloudy... along with distance : portrait, group, landscape. The frame counter has to be reset manually. Let's aknowledge that the Soviet engineers achieved to produce a simple camera at a very low cost.